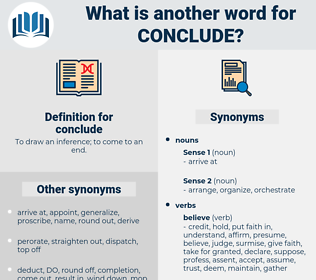 What is another word for conclude? To draw an inference; to come to an end. call a halt (to something). doest a bang up job. getting out of the way. are, AM, infer, contend, suggest, find, celebrate, decide, stop, finalise, enter, consider. 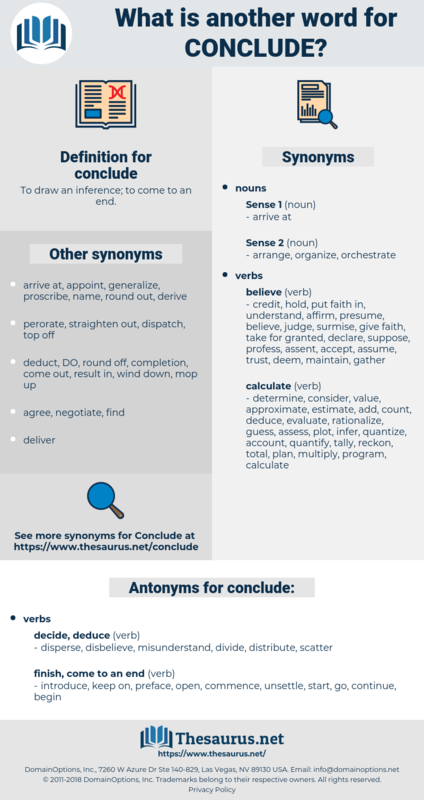 lay, infer, culminate, wrap, suggest, cease, find, deduct, discontinue, celebrate, accomplish, seal, decide, complement, construe, arrange, stop, forge, concede, finalise, settle, proceed, formalize, enter, draw, summarize, consider, shut, assert, sum, commemorate, endpoint, affirm. disperse, disbelieve, misunderstand, divide, distribute, scatter. introduce, keep on, preface, open, commence, unsettle, start, go, continue, begin. fail, destroy, disprove, forget, ignore, not finish, miss, neglect, invalidate. halt, initiate, waver, vacillate, decline, refuse, extend, institute, stall, waffle, temporize, hang on, set about, reject, delay, abstain, enter upon, turn down, hesitate, originate, inaugurate. I might, and I may conclude to raise a large crop some time. We conclude then, that nature as known to us is an idea; that Nature is one thing and the idea of nature another. extrapolate, derive, induce, feel, gather, syllogise, deduct, generalize, syllogize, perorate, infer, find, deduce, generalise. cogitate, cerebrate, think, end, terminate. end, cease, terminate, finish, stop.